Cute necklace! I think I like it even better than as earrings. I am trying to be the person my dogs think I am. Delicia and Diane, thank you! It was fun to put some broken stuff to good use! added a few goodies and off to it's new home it went. That is such a great idea and you did a fab job on the apron. A girl after my own heart . . . taking something "hideous" and transforming it into SPECTACULAR!!! Since this is "repurposing"..I thought Id ask about repurposing jeans into skirts...Has anyone done that ? "LOVING" life at 4000 feet elev. Not sure if this counts as repurposing or up cycling, or just "building a better mouse trap". My laundry room can't fit a big ironing board. 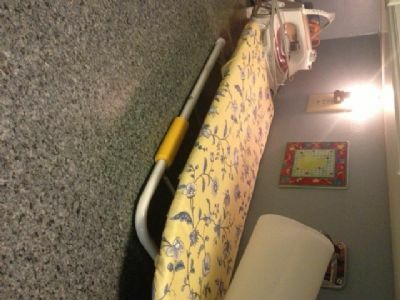 For twenty years, I've ironed on a little tabletop one. It was no longer able to stand, and the top was horribly stained. Looked everywhere for a nice wooden one, even full size, to no avail. Lehmans no longer carries one. So I went to buy another tabletop one, only to find they are even more flimsy. So....I recovered mine. Took the hardware off. Found the iron had leaked and the particle board had rotted in places. So I got rid of the wooden bits, removed the old rotten foam, and used a thick, old towel cut to fit as padding. Then used fabric from my stash and a heavy duty stapler to cover. Banged out the hardware so it no longer falls, and used foam from an old baby carrier handle at the bottom to keep the board from sliding on top of the table. Better than ever now! Now it works so well, I'll recover the full-sized one in my upstairs sewing room. The thick toweling is so nicer than the cheap thin foam boards come with. Sorry could not get the photo to turn right for some reason. Don't judge each day by the harvest you reap, but by the seeds that you plant. Thrift shop find king-sized pillow shams and inflatable camp pillows into glamping pillows that pack FLAT for tent glampers. You can never be to kind! Great idea, Cindy. You'll have to post pics when it's filled with greens! I have taken towels that are past their prime and soaked and washed them then cut them into smaller peices to use as wash cloths and dishcloths. For the washcloths I zigzagged the edges as is for the discloths,I cut them slightly bigger and put 2 together and zigzagged the edges together. Polor fleece blankets make great insulating curtain for your windows...helps keep it warmer in the winter and cooler in the summer. I have antique suitcases that we store our videos and dvds in.They look cute and hide them very well. So many things I have done and of course these are all I can think of at the moment.Whoever started this thread...Thank you! Nicole FABULOUS!!! You are very resourceful, nice job ! I was given a pretty large metal birdcage, it is metal but a little ornate. I did not want to throw it out. I asked several people who have birds if they wanted it. Nobody I know wants it. Does anybody have any ideas about repurposing it?
" A dog's tail never lies "
Annie,what about using the bird cage for a plant..something like an ivy or other vine,maybe one with flowers? Annie, for your birdcage can you spray paint it and fill it with trailing plants? Or take the bottom out and set it over a plant in the ground? Oops I see CJ6 mentioned that too. I've torn an old sheet into strips to crochet a rug, and used the strips to tie up garden plants. Old tee-shirts can be cut into strips for crocheting. My favorite last year was buying dollar tee-shirts at Good will, and making skirts out of them. They are the best summer-time-keep-cool-work-around-the house skirts! I'm repurposing an Altoids tin into a mini sewing kit. One component of this is a repurposed magnetized needle holder - My yellow pages phone book came with a advertisement for a dental office printed on a magnet backing - I cut this to fit the inside lid of the Altoids tin and used Mod-Podge to glue it in. I photocopied the cover of a purchased journal that had some artwork that I liked (raspberries, blossoms, birds and butterflies) and mod-podged it to the top and bottom. I'll post a photo when it is complete. The other project is using a Simplicity pattern to make a cover to repurpose an ice cream bucket as a sewing supplies tote. Not very original, but I am having to make some changes. It seems the ice cream companies have changed the size of the bucket (Smaller, of course, not larger) since the pattern was designed! I got this idea on Pinterest. Just finally joined and it is just what I thought...a big time sucker! Boy is it chock full of ideas, though. Anyway saw the idea for this. 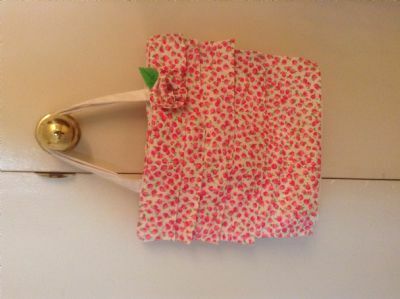 I repurposed an old tote into a summer purse using fabric scraps. I added an embroidered leaf to my flower and a crystal button in the middle, as well as made a cell-phone pocket for the inside and a snap to keep the top shut. Also made a flat bottom for it by covering cardboard in fabric. Can't get my photos to stop turning! Sorry!